This week it is Tara Godfrey's turn to be showcast :) Her blog is Inking on the Edge, and let me tell you... boy, what a colouration talent!! 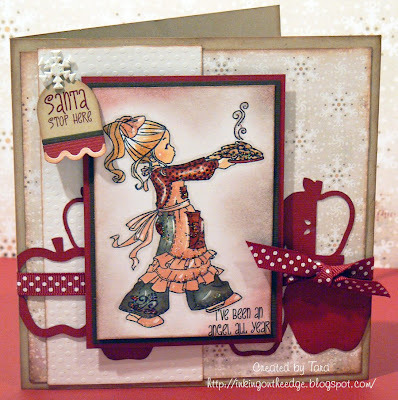 Tara created this stunning card "Santa Stop Here" after my sketch #36 and used Willow with Cookies as central image. The great die cuts provide the final kick of this fabulous creation. Diese Woche ist es an Tara Godfrey's von Inking on the Edge bei mir gezeigt zu werden. Ihre Colourationen sind ein wahrer Traum! Tara hat diese wunderbare Karte "Santa Stop Here" nach meinem Sketch #36 gebastelt und Willow mit Keksen als zentrales Motiv verwendet. Die tollen Stanzteile geben der Karte noch den letzten Kick. Danke Tara! I wish all of you a fabulous sunday and don't forget to check back tomorrow when the previews for the new Whiff of Joy release "Party Animals" designed by Alison Acton start. Not only I will start showing cards and projects with the new stamps, but also the amazing Whiff of Joy Designers will present their creations. Tara did a wonderful job! You are right, her coloring is awesome!! Can't wait to see the new stamp line tomorrow!! Great choice Katharina!! Tara's work is gorgeous!!! Beautiful card. I love this stamp as I have it also and it can be used in so many different ways and themes. Your sketches are FANTASTIC. This card is gorgeous! Tara did a great job! Love her cards and the way she colours her images! Can't wait to see the new stamps!! Oh, Katharina, Thank you so much for featuring me on your blog for YAOB! I'm so thrilled that you picked this card, as, I really like it too, smile!!!! It was your fab sketch that made it all come together so nicely! All your sketches are so fabulous and I just love your WOJ stamps too!!!! Sorry, I am just learning about this exciting news today...yesterday was my Kieran's, 7th B-day! So, we were celebrating what a big boy he is now, smile!!!! Thanks again for all your kind words!!! WOW!!! I will be flying high all day,lol!! !